Posted August 24, 2016 by La Lune Collection & filed under Interior Design, Rustic Furniture, Rustic Tables. The console table – or “sofa table” as it’s often referred to today – exists in its present day form by way of an interesting evolution. Originating in France in the early 1700’s, console tables were small, half-moon shaped tables fastened to the wall at counter height with a “console” – or a little curved bracket – and featured only front legs which were added to make them appear to be free-standing. Appropriately enough, these diminutive tables were tagged “demi-lunes”, literally meaning “half-moons” in French, and were used mainly for decorative rather than functional purposes. Later in the 18th century, when the console table developed the rectangular shape we know today and “sprouted” four legs, its popularity spread to England and the rest of Europe, and subsequently to the Americas. 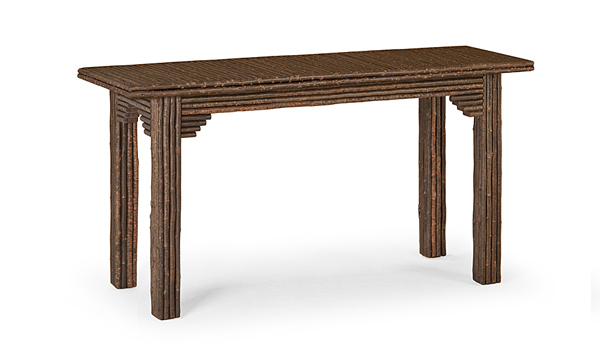 The console table is now a staple in entryways, behind sofas, along hallways, and in myriad interiors in residential and commercial spaces, large and small, and of all design styles. 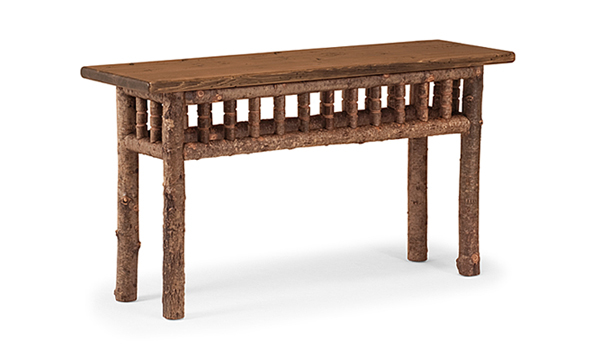 Today, La Lune Collection proudly features a beautiful collection of rustic console tables, and we’ve curated below a few of our favorites. 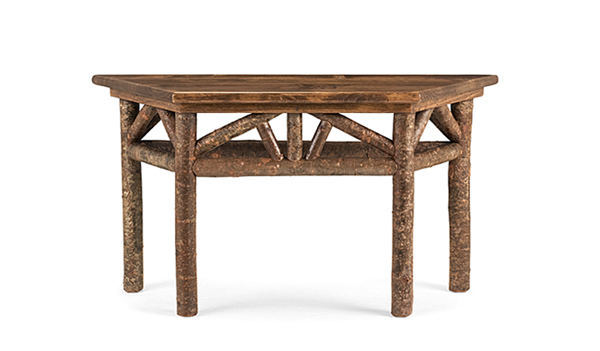 This Table features a charming rustic design of hand-notched branches – carefully constructed by our furniture artisans, using the same simple tools and techniques employed by furniture craftsman for several centuries. 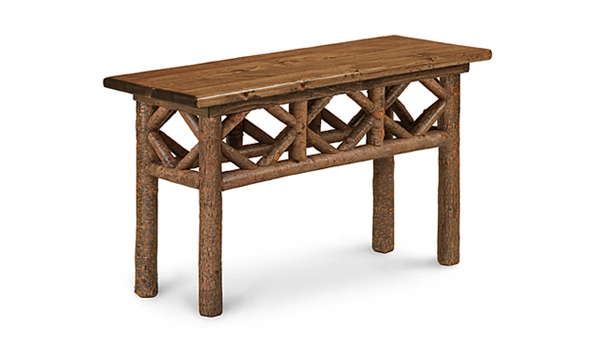 Classic rustic styling lends this Console Table its charming appeal – created by La Lune’s fine craftsmen, who travel the rivers and forests of Wisconsin carefully selecting and harvesting the woods to construct each piece. A graceful combination of angled branches makes the design of this Table exceptionally beautiful – a welcome sight in a foyer or entrance, or just about anywhere. 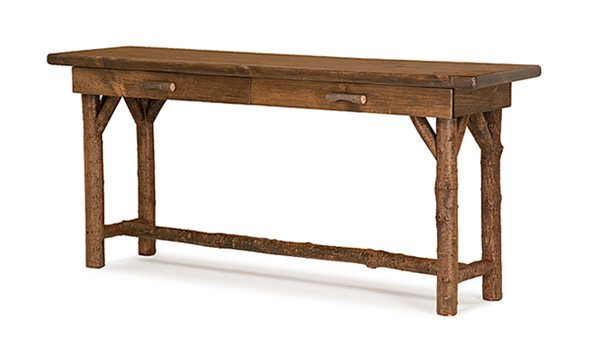 This Console Table is a fine example of strong, simple and beautiful rustic design – demonstrating the natural beauty of the poplar branches of which it’s crafted. 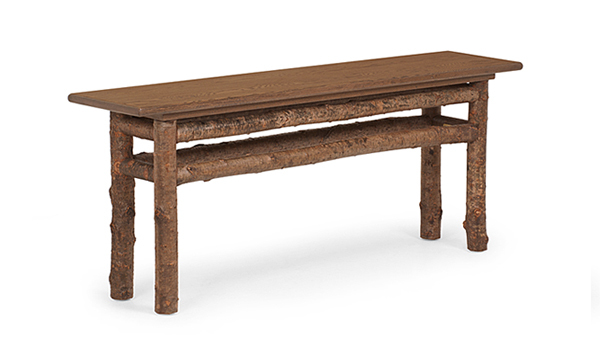 Classic rustic simplicity is the hallmark of this Table. Beautiful and functional with its storage drawers, it makes a striking addition to many design applications. 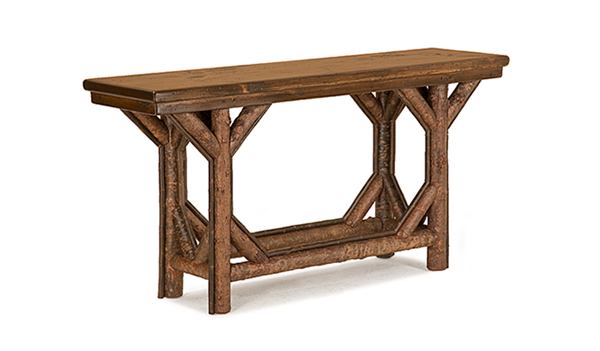 This Table features a charming rustic diamond design motif – marvelously constructed by hand in La Lune Collection’s Wisconsin workshop. Poplar branches are carefully selected – then individually cut and meticulously hand-applied by La Lune’s skilled artisans – to create the beautiful patterns on this Console Table.